I was trying to figure out how to redistribute routes between some VRFs for a project that I am working on. I won’t get into details of the project or specifics, but ultimately the goal was to be able to leak routes between the VRFs so that we can gain access to the management ports on some devices. Since VRFs are separate routing tables that co-exist within the same router and cannot see each other, getting communication between them can be difficult at best. 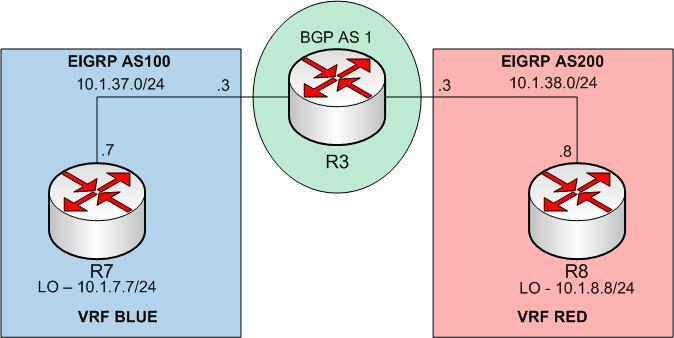 Using some the features of PE routers, you can overcome this limitation by using BGP to redistribute between them. Below is the diagram that we will be using for this config. What we will do is configure R3 to redistribute routes between VRF RED and VRF BLUE to enable connectivity. Now when it comes to R3, we need to be a little creative. Here we will place the interfaces in the appropriate VRFs and configure EIGRP and BGP. VRF BLUE will have a RD of 1:1 and VRF RED will have a RD of 1:2. The command route-target will allow us to import and export based on the RD assigned to a given network. The next step is going to be to configure a lone BGP session where we can redistribute and place the routes in a VPNV4 environment. Basically we are creating a lone SP network where VPNV4 routes are “exchanged”. You do not need a neighbor for this, just a BGP session configured and IPV4 VRF families. A route distinguisher is an address qualifer used only within a single internet service provider‘s Multi-Protocol Label Switching (MPLS) network. It is used to distinguish the distinct Virtual Private Network (VPN) routes of separate customers who connect to the provider. The route distinguisher is an 8-byte field prefixed to the customer’s Internet Protocol address (IPv4). The resulting 12-byte field is a unique “VPN-IPv4” address. There is a more detailed description in RFC 4364. At the edge of an MPLS provider’s network, a router which connects to a customer’s network is called a Provider Edge (PE) router. Similarly, the customer’s edge router at the other end of the connection is called a Customer Edge (CE) router. Within an MPLS network, a PE router needs to be configured to associate each route distinguisher with routes which lead to a particular CE router. The PE router may be configured to associate all routes leading to the same CE router with the same route distinguisher, or it may be configured to associate different routes with different route distinguishers, even if they lead to the same CE router. Oh the joys of Microsoft Network Load Balancing (NLB). One of the wonderful ways that it is usually configured is using a Multicast MAC address utilizing a Unicast IP address. Needless to say, most network devices do not like that and thus have problems when devices outside the local LAN attempt to connect to the NLB address. In order to work around this problem you need to configure a static ARP entry on the gateway so that the devices know how to get to the server. Well, just wanted to post up what has been g0ing on and the lack of updates. Add to that we are going on our yearly trek to Disney on Saturday, things have been busy. I have not abandoned this blog, nowhere near that – just been a little busier with life lately.